Bellagio delivers extraordinary experiences with world-class amenities that create lasting memories. Inspired by the villages of Europe, AAA Five Diamond Bellagio overlooks a Mediterranean-blue eight-acre lake where the world-famous fountains of Bellagio take center stage to mesmerize guests. Within Bellagio are award-winning dining experiences, including two AAA Five Diamond restaurants, Julian Serrano's Picasso and Le Cirque from the renowned Maccioni family. At Spa Bellagio, a diverse array of innovative international treatments is designed to provide the ultimate indulgence. The luxury retail promenade, Via Bellagio, includes Louis Vuitton, Giorgio Armani, Gucci, Harry Winston, and Chanel, amongst others. A world-class art gallery, exquisite Conservatory,Cirque du Soleil® stunning performance of “O™,” renowned nightlife, and elegant casino add to the extraordinary Bellagio experience. At Bellagio Spa and Salon, an array of innovative worldly treatments is designed to provide the ultimate indulgence. Distinct services include aquatic therapy in a designated water treatment room, Thai yoga, and the signature Tandem Massage, a four-hands ritual inspired by the Fountains of Bellagio. Additional relaxation can be found at Bellagio’s Mediterranean-style pool complex, which welcomes guests to a villa-like retreat, complete with pools, whirlpools, and private cabanas surrounded by citrus and parterre gardens. The overall design of the 65,000-square-foot spa and salon is Zen-influenced, balancing natural elements with clean, sleek features. The meditation room is encased by “water walls” lit by candles. The salon is outfitted with mani/pedi stations, a barber room, and bridal/bachelorette area, and the men's spa area boasts an outdoor relaxation balcony overlooking the Bellagio Pools. Spa services use Comfort Zone, Phytoceane, Sanitas, Vie, DoTerra Oils, and Pure Fiji products. The spa is open 6 a.m. - 8 p.m., seven days a week, while the salon is available 8 a.m. - 7 p.m., seven days a week. The 100,000-square-foot casino floor is a gaming Mecca, with blackjack, craps, roulette, European roulette, baccarat, pai gow poker, Caribbean stud poker, slot machines, a race and sports book area, and more. Also available on property is "O," performed by Cirque du Soleil at Bellagio and considered to be among Sin City’s most successful shows, and the Fountains of Bellagio, which are choreographed to lights and music and recognized as one of the area’s most famous attractions. The Conservatory and Botanical Gardens encompasses over 13,500 square feet of seasonal plants, flowers, and trees, and the spa’s 6,149-square-foot fitness center provides yoga, boot camp, spin, Zumba, and personal training. Retailers in the hotel include Giorgio Armani, Prada, Chanel, and Dior. 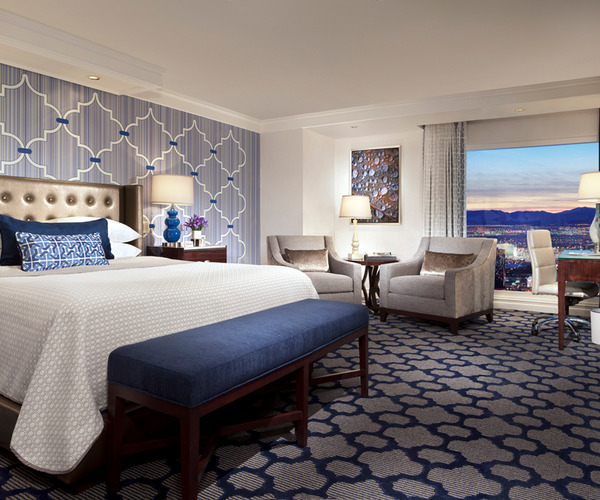 At Bellagio, guest rooms and suites pair modern conveniences with the warmth of home, featuring sweeping vistas of the resort's lake, surrounding mountains, and Las Vegas skyline. Discerning guests who book a penthouse suite are invited to indulge in the luxurious chairman’s lounge, which offers a private registration and concierge experience. Bellagio’s restaurants run the gamut from gourmet Five Diamond to casual dining. The hotel features a Michelin two-star restaurant (Picasso), two Michelin one-star restaurants (Le Cirque and MICHAEL MINA Bellagio), two AAA Five Diamond restaurants (Picasso and Le Cirque), and a James Beard award-winning restaurant (Picasso). Bellagio also is home to four James Beard award-winning chefs: Jean-Georges Vongerichten, Todd English, Michael Mina, and Nevada’s first James Beard award recipient, Julian Serrano. In 2015, Chef Serrano debuted Lago restaurant, featuring innovative Italian small plates overlooking the famed fountains.